I was also thinking about a Buck ROgers for $1100, but this seems like a much better option. Thoughts? Thanks in advance! 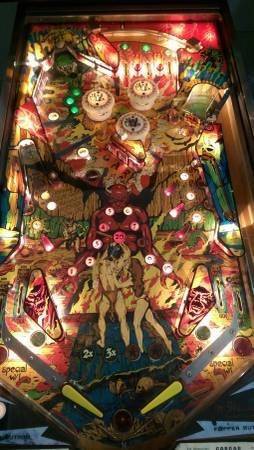 eight ball isa good game, but always be suspicious of someone that never shows photos of the whole playfield. It did seem a little shady - I was planning on going over there if the guy gets back to me and checking it out. Looks good enough for the price. Would be a good 1st machine. Check it out. The early ss bally pins are a great first pin. If the pin boots most other problems are relatively easy to fix. 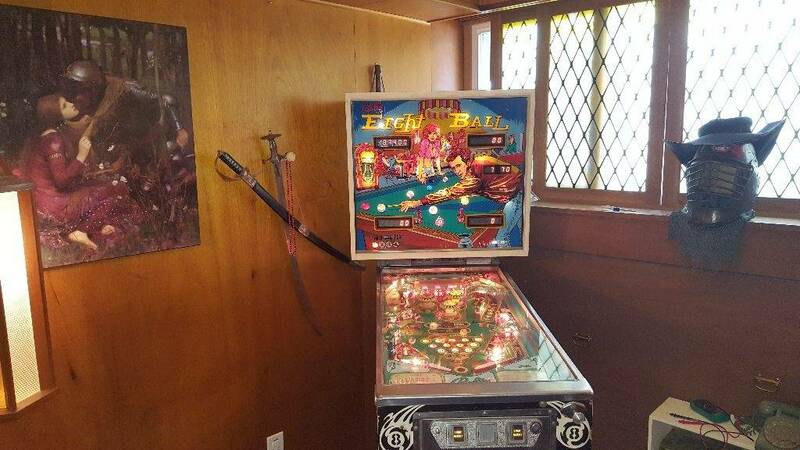 Eight ball was my first pin, I still have and enjoy it. Damn, looks like someone else picked it up. Now the only two on the list are Buck Roger for 1100 or Gorgar for 1500... both seem pretty overpriced. First pinside rule. Never include a link to a nice game you are looking at. You can attach pictures and ask about condition/price but don't include a link until it is in your truck. 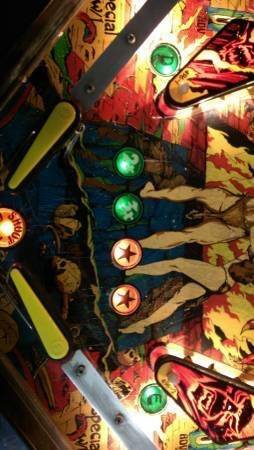 Gorgar for $1500? It better be perfect. Quoted from Travish:First pinside rule. Never include a link to a nice game you are looking at. You can attach pictures and ask about condition/price but don't include a link until it is in your truck. Thanks Travish- keeping your advice in mind, the guy says its in players condition, but a little planking on the pf, which is fairly evident. Only thing making me seriously consider it is that he'd deliver from 2+ hrs away from me. Good info about early Bally SS machines. 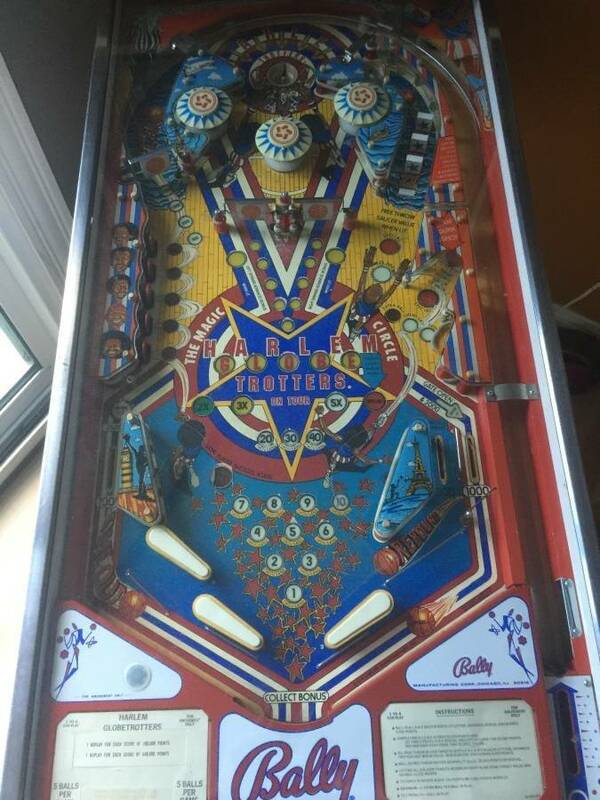 While we are on the subject how are the early Gottlieb SS machines? Would they be a good choice for a first pin if priced right? I asked because I just missed one recently but someone told me they were troublesome and I didn't miss anything. 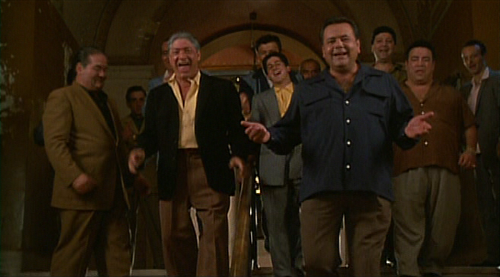 $1500 is WAY steep for that condition Gorgar. That is about a $700 machine if everything works. Here is a easy way to figure out past selling prices here. On the top of each page is the pinside heading. Click on games then type in Gorgar and click on find games. Then click on the picture. Then scroll down to "archived ads for this game". You will see all the machines and prices. 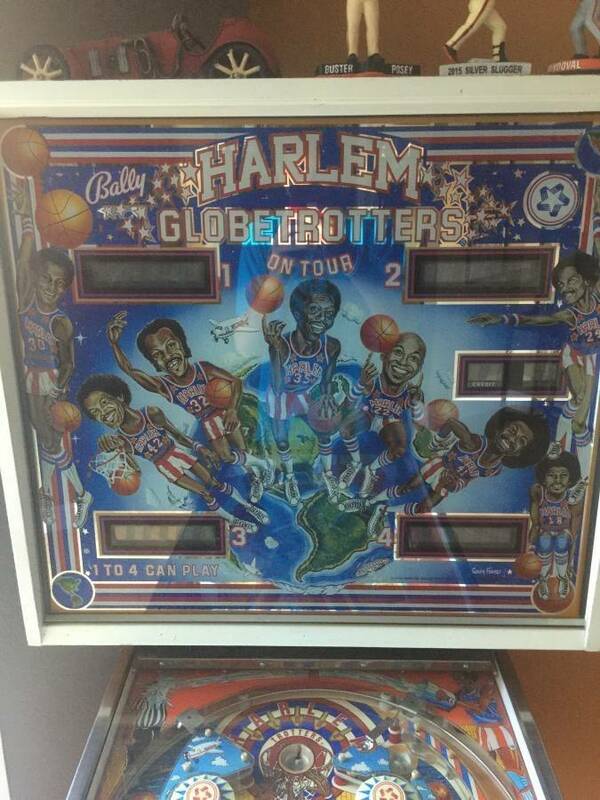 One final question for now: Located a Harlem Globetrotters, for $1,000, willing to hold it for a while for me (huge plus). love the gameplay on Paragon (at least on TPA) and have heard this is somewhat similar. The playfield looks immaculate and BG looks pretty nice too. Now that's more reasonable. Ask for more pics, especially ones with the machine on so you can see displays, and of the cabinet, and the back of the backglass. The pf looks very solid, as does everything else you can see. If this works, it seems like a reasonable price in CA. albummydavis - just asked for those pics. Curious as to why the back of the BG is important? He says it is "no wear works perfect" but for some reason replied to my request for BG pics by saying "the glass is fine." Maybe he thinks I'm asking about the glass over the pf? Also, any insight into the odd half-moon wear over the slings? Back of the backglass will show the condition...if it's flaking or falling apart back there. Ems/ss machines back glass condition is important and pricey. The backglass question is to see if the paint is flaking off. What looks like "odd wear" is actually Mylar protectors so it doesn't get worn there. Beat you by half a Second! Uhg. After saying the "glass is fine" he hasn't said anything or responded to my requests for pictures with the game on. Maybe its non-working and he's trying to scam someone. Also, what's up with the insert above the "7" bonus number? Appears its fallen out or am I blind? Ill give him a call and see if he's willing to send those photos. Thanks for the advice folks. Got a hold of him: he sent this picture as well as a short low res video of him playing the game. Flippers and bumpers work, didnt see about the slings but would have to assume so. Honestly don't care that much about the BG, and it looks good enough from the picture further up this thread. Should I go for it? Planning on heading there in the next couple days. Been watching some gameplay videos and it looks pretty fun and not too easy to get bored of. Does appear that the light on the center bumper is out, however. The reality is, you're not going to get a perfect machine, especially in CA at that price. It looks solid. Go take a look and if there's real problems, then you don't buy it. That's the best you can do. If I was interested in that game, I'd commit. Just make everything works before you hand over the cash. haha listen albummydavis that's great advice. A bulb not working isn;t even close to being a problem right now. Make sure all the big stuff works and worry after you get it. Well, made a choice that probably wasn't the most wise, but hear me out - went for the Gorgar, got it down to $1050, and the guy is driving here and setting it up for me, which saves me renting a Uhaul and buying straps etc. So more like $850. The guy who owned the HG seemed increasingly odd about wanting money up front, and Gorgar I've always liked. It'll be here today, will probably post some pictures and will definitely swap out the black rubber for white. Just jump in and see what happens. First one and all it isn;t a bad idea to have someone set it up and make sure everything works. Nothing wrong with Gorgar for a first game. Dont be in a rush to order parts, make a list then wait a day or two to ensure it's complete. You will ALWAYS think of something else needed minutes after you hit submit and shipping adds up fast. Download PDFs of the manual and schematics because you will need them sooner or later. 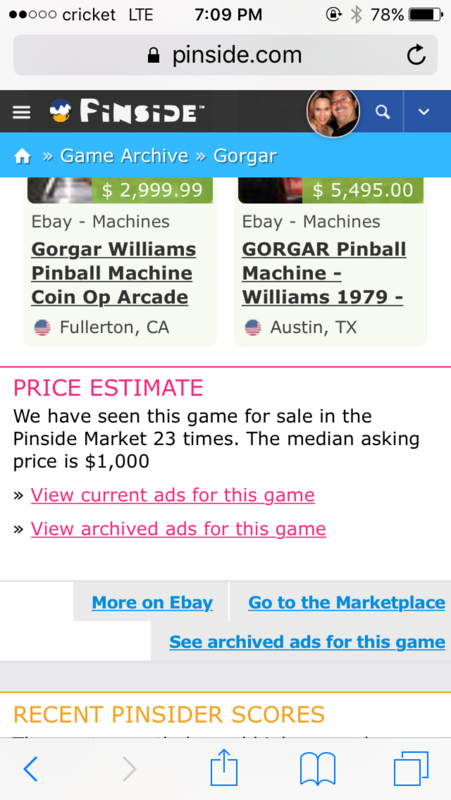 Gorgar was my first machine and I still have it. Its actually a great game. CPR has Gorgar on their list for new playfields. Wish it would move up the list. Thanks guys! Have the machine now - one odd issue. Was playing a couple games to check all components on the pf worked, turned it off in the middle of a game, and now it powers on, goes into attract mode, but wont start a new game (even if I put a quarter it). Whats up with that? Is it an issue with the credit system? Im totally clueless so any advice would be greatly appreciated. 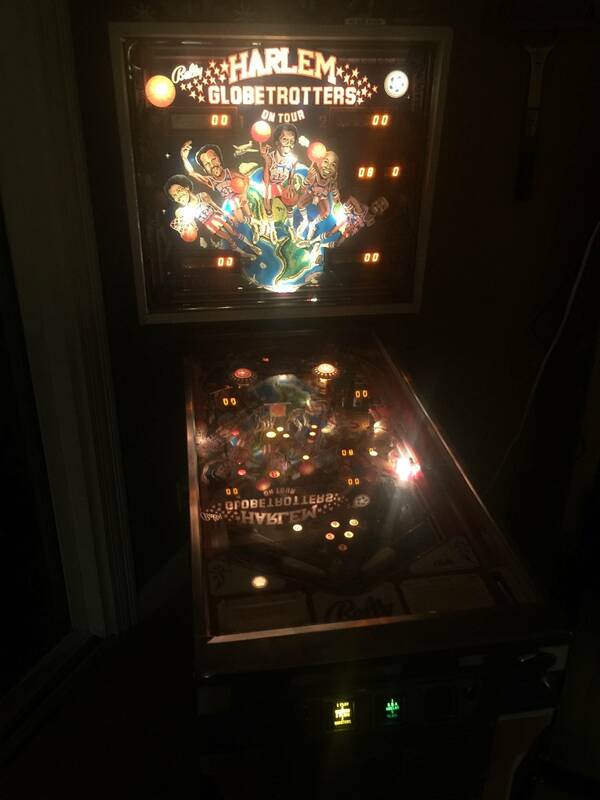 Update - now starts a game through the unlit coin slot - but the sound isnt on. Was on and nearly all the way up earlier. Is there a way to put it on Free play? Baby steps! just put coins in or manually push the switch in. Sometimes you gotta bend the metal protector shielding the switch (not famialir with this era williams). In the settings you can put it on free play. You use the switches inside coin door to manipulate the settings. Function 18 set to "0" is free play. Download the manual and it shows how. Remove and replace all the connectors on the sound and speech boards in the back box. It's on the upper right. Reset all connectors on the sound card. Ensure all the sound roms are pressed in firmly. Rest that ribbon cable . We probably won't hear from the OP for a couple of days, he's busy. Thanks guys, indeed been somewhat busy haha. Got the audio and free play sorted out, but the left flipper, after working for a while, crapped out. Have repeatedly adjusted the large screws that grip the flipper shaft, which once fixed it before it failed me again, and cleaned the inside of the coil and plastic sleeve with rubbing alcohol. After tweaking the alignment screws many times, the left flipper still won't work. Any ideas? Planning on ordering a flipper rebuild kit tomorrow. So it's not working at all? The flipper shaft screws just hold it in the correct position. 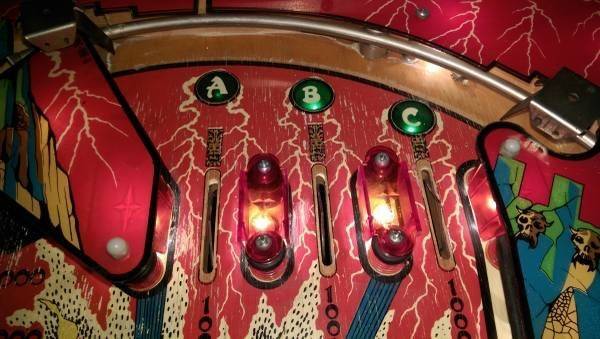 I would check the contacts on the flipper especially the end of stroke switch but it sounds more like the switch mounted on the cabinet that the button presses. Look to see how bad the contacts are pitted and see if it's making good contact. travish - does appear to be the contact on the cabinet - dont know how to go about bending it back into the correct position. Pics in the new thread - thanks for all the help. Hmmm, I think I know who the "someone else" might be? For whatever it is worth, I did not find out about it from this post. Oh', and did he forget to mention that some of the 6 digit displays were broken? Depending on how much of a project you were looking for, you may have done well with your Gorgar! Yeah, sounds like you got a bit more of a project than me! I am very new to fixing pins / soldering etc, so glad you beat me to it. On the phone he said that everything was working besides the top roleover lanes, which he described as registering for points but not 'making any sound.' Is that the case? He also said some bulbs were out. So he must have been fibbing about the flippers, rubber, and waxing. Either trying to get rid of it quick, or didn't even plug the game in perhaps? Hope it gets playing smoothly soon! This is my first pin, so I too am a bit new to this. Fortunately, I am familiar with basic electrical and mechanical repair, so this has been a fun challenge so far. Was he "fibbing"? Well... I guess it is all how you look at it. The flipper action was strong, (he just left out the minor detail that it was also cracked and broken). The rubbers were arguably in good shape for being 20+ years old (which to most of us would be, not too good). It is all coming together. I have a few more parts on order, but it already plays well! If you find yourself in the Castro Valley area, look me up and I will let you try it out. Looks good! Glad it wasnt too much of a project. Ill certainly contact you if Im in the area.